Set up in front of LaRee Ruteshouser’s parents’ house is her art studio, where she is surrounded by different types of paint. LaRee uses the “hidden waterfall” method on her canvas, the colors slowly spreading out as she pours them. She tilts the canvas, getting rid of unwanted colors bit by bit. What eventually comes out is a unique mix of color on the canvas that LaRee adds to her diverse collection. 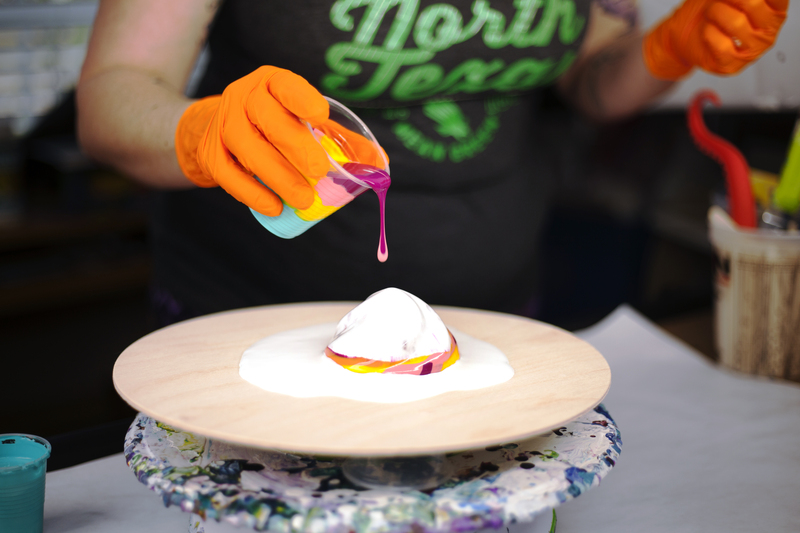 While LaRee has been making art her whole life, she began pour painting two years ago when her mother introduced her to the practice. LaRee Ruteshouser has been pour painting for almost two years. Ruteshouser is in Ripley’s Believe It or Not for the most colors used in a paint pour. Image by: Cameron Roe. LaRee starts by mixing her paints and deciding what colors to use as she goes. Pour painting is usually done with acrylic paint but she includes additives and said she enjoys experimenting with alcohol ink. LaRee enjoys pour painting as a way to relax and describes it as a freeing activity. LaRee said before she starts painting, she does not always know what the piece will end up looking like. She uses different types of tools including silver leaf, a metallic silver paint, to create different patterns. Other utensils she uses include a flip cup and swirl pod. The process of pour painting, LaRee said, acts as a de-stressor and helps her in taking time to relax. LaRee was introduced to the idea of pour painting by her mother while LaRee was on maternity leave. Image by: Cameron Roe. LaRee’s art has been showcased on multiple platforms. She sells some of her art to collectors, but most of her painting is shown in videos her mother uploads to Facebook. 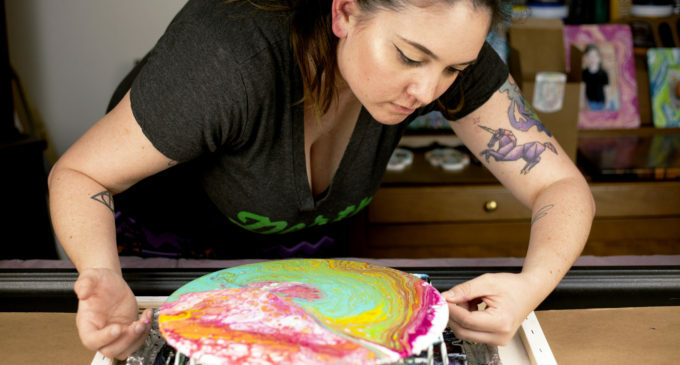 She has also published a book and completed a challenge that was featured in “Ripley’s Believe It or Not” for the most colors used in a pour painting. Sean has known LaRee for four years. Both LaRee and Sean attended UNT, and LaRee said she also feels her art has changed since then. LaRee has had art featured at Midway Craft House in Denton. LaRee said she uses different techniques to make her paintings unique. She adds white so the end result will resemble biological cell patterns and tends to lean toward darker colors. 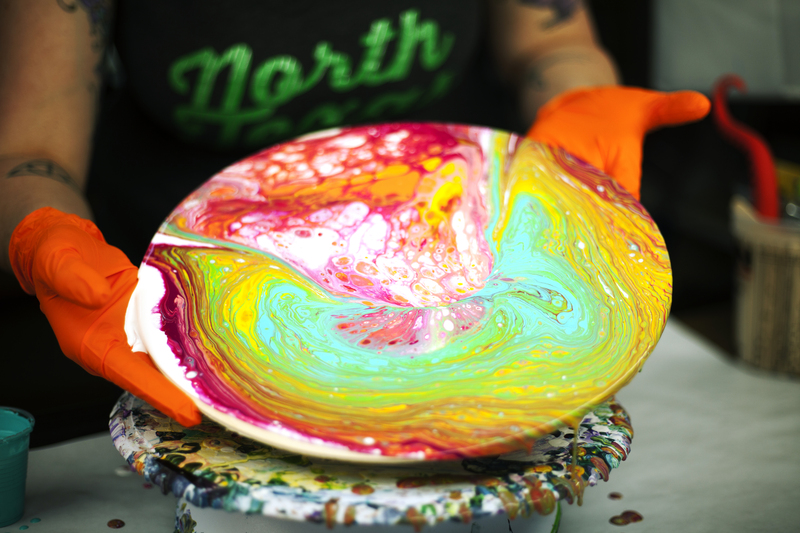 Featured Image: Pour painting artist LaRee Ruteshouser moves her finished artwork from her studio table to take upstairs to dry. LaRee has been making pour painting art for almost two years. Image by: Cameron Roe.